The posse was up early for a good breakfast and even an early enough departure to see the sun still on the rise in the desert plain. 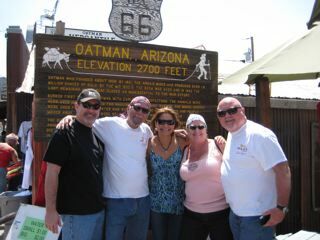 We decided to head out to Oatman. It’s a turn of the century mining town along Route 66 in Arizona, about 30 miles outside of Laughlin. As we headed out we got a taste of the snarl of traffic. 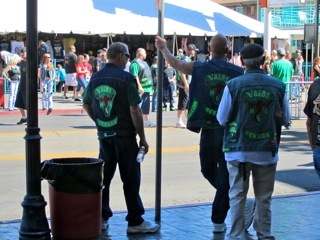 A constant parade of Harley’s and “gawkers” line the main street moving about 3 MPH. I even noticed some of the same people doing the loop from the night before. We crossed the Colorado River and turned into Bullhead City, AZ. The first thing we notice was all the bikers without helmets. It’s legal in AZ and we continued the slow ride for a few more minutes until the traffic thinned out and the pace picked up. Bullhead City seems to go on forever…a town that has a “sprawl” problem, but in the desert you build out rather than up. Finally we hit the Oatman cutoff road and thought about getting on the throttle, but every biker was waving at us to slow down…it didn’t take long to figure out why. About every 2 miles there were Arizona State Police with radar guns checking that anyone going over the state-mandated 45 MPH speed limit would get pulled over. It’s not so boring doing 45 MPH, but the beefed up presence of State Police puts a bit of a rain cloud on any ride. Then there were the sobriety checkpoints. 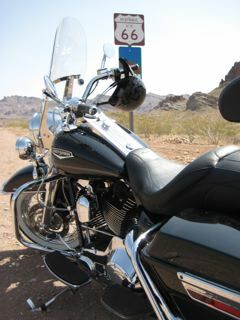 In previous years they had checkpoints on the way out of Oatman when heading toward Laughlin. This year they blocked both lanes and checked everyone going in and out. Harsh! I guess in the “old” days (circa: 1995) Oatman was a rip-roar’n party town. People doing burnouts, drinking in the streets as well as partially clothed passengers showing off, but then a person was killed and the reactionary town fathers took control. Now 13+ years later it’s all about vendor booths, drug sniffing dogs and hot dog stands hawking t-shirts to get as much of the suburban biker wannabes wallet share as possible. Oatman is a fun town even with out burnouts and if flashbacks to the old mining days are your thing, you’ll be able to get your fill. Sunburned riders lounge around enjoying the atmosphere and weather. And at a minimum you can score one of those antique style photos of yourself holding a rusty rifle and dressed like a barkeep. There’s even a free petting zoo in the middle of the road. Burros walk aimlessly along the main street acting somewhat annoyed at all the attention. They are protected by the Wild and Free-Roaming Horses and Burros Act 1977 (pdf), but the Oatman Burros have no fear of people or bikes. 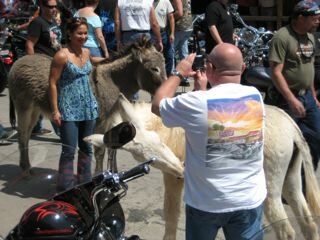 And if the Burros don’t draw you to the town there is the Oatman Hotel. Built in 1902 it’s the oldest 2-story adobe structure in the Mohave and is a famous landmark for the honeymoon stop of Clark Gable and Carole Lombard who stayed there after getting married in Kingman. 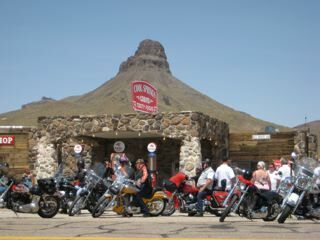 Speaking of Kingman, we were looking for more distractions than what Oatman had to offer and headed out on what’s called “The Gold Road” which is one of the oldest and most historic sections of Route 66 over Sitgreaves Pass. We stop at Cool Springs Camp for a soda and honey bucket visit. This camp was a pile of rubble for many years, marking where a store and gas station once stood. It burned to the ground in 1966 and the owners from Chicago have been rebuilding it for years. We chatted with the care taker on the property who told us the Chicago owners were putting it up for sale (although no signs indicated it was). It’s worth a stop for the almost frozen soda and to look over the mini-museum of autographed album covers. We followed Route 66 down into the desert which eventually meets I-40. We took the interstate, but you can pass underneath, and follow the signs to the north and east, to stay on Route 66. This will take you up the old Santa Fe railroad gorge into Kingman. We arrived at Kingman and stopped at a bright pink-and-turquoise building. This is Mr D’z, one of the few remaining, original (okay, renovated) Route 66 diners. They’ve even had an Oprah sighting! We were hungry and stopped in for a famous hot dog and a mug of their home-brewed root beer to wash away the dust of the trip. After lunch we followed Highway 93 out of Kingman, up and through Coyote Pass. 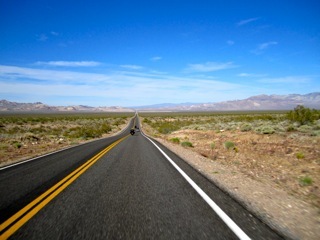 This is a wide, four-lane highway, as it is part of the main route to Las Vegas and took us back in to Laughlin. We spent the evening talking how we soaked up some incredible scenery and walked through the numerous vendor booths. We caught some of Chris Hiatt’s tribute of Stevie Ray Vaughan at The Edgewater. He even had the signature black flat-brimmed hat that made Vaughan so famous. 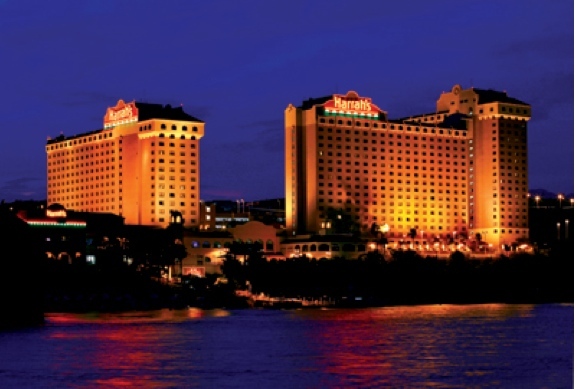 Day 3 of the Laughlin River Run coming up next…. There are 16 days until I fly into southern Nevada for the Laughlin River Run. The event offers great riding and solid entertainment typical of a gambling resort. More than 60,000 people converge on this event located on the Colorado River April 23-27 for one of the premier Biker shows in the West. 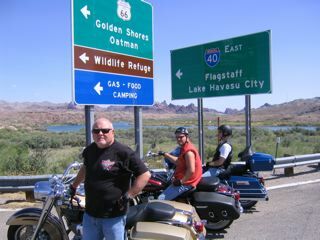 For the geographic challenged biker, Laughlin sits just south of Vegas, north of Phoenix, and east of L.A. in between two mountain ranges in the Mojave Desert. Traveling from the cold and rainy Northwest means the Mojave weather this time of year provides great riding conditions and lots of scenic views for cruises. If vendor booths wear you down, there’s always time for margaritas by the pool or time to throw the dice on the craps tables. We’re planning to cruise Red Rocks Canyon, run Route 66 into Oatman, AZ., check out the London Bridge in Lake Havasu City and stop in at Hoover Dam on the return trip to Vegas. 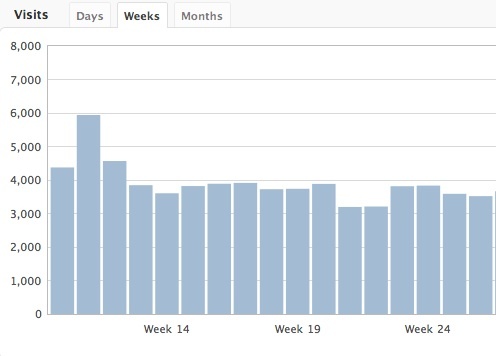 I won’t be doing blog updates. Let’s save that for the dudes getting paid for their journalistic aptitude. I’ll do a post or two when I get back and describe some of the activities we participated. Last year I put on ‘Cheap Sunglasses’ and caught Billy Gibbons, Dusty Hill and Frank Beard in concert. Better known as ZZ Top it was an awesome show. This year I’m looking forward to catching Foreigner in concert. They made some great music. Updates on this trip start HERE.